21 February Paragraph: The 21st February is a red letter day in our national life. On this day in 1952, the brave sons of our motherland laid down their lives to protect the interest of our mother tongue. Since then we had been observing this day as ‘Shaheed Day’. But in 1999, UNESCO declared this day as ‘International Mother Language Day’. This declaration has turned a national celebration into an international event. We used to celebrate the day at our national level because it was not only important regarding our mother tongue. Rather, the day had greatly influenced all the struggles of the people to establish legal rights including our Liberation War. But with the declaration of the UNESCO, a new dimension has been added to the day. The teaching of the day is that we all should respect the mother languages of others. Our mother language is our unique possession. In the same way, other people’s mother languages are also priceless to them. In broader sense, the day teaches us to have respect for people’s rights. On this day, everybody wakes up early and gathers before the martyrs’ monument barefooted just to offer their profound respect to the martyrs. The govt. and different organizations arrange programmers to celebrate the day. All the states under UNO also celebrate the day every day. The 21st February is observed as the International Mother Language Day. On this very day in 1952, many heroic sons of the soil laid down their lives to establish ‘Bangla’ as the official language of the country. It is also observed as Language Martyred Day of Shaheed Day. On this day people wake up early in the morning. They put on a black badge to mark the day as a day of mourning for them. They walked to Shaheed Minar barefooted with flowers and wreaths in hands. They offer flowers and wreaths on the foot of the Shaheed Minar to show love and respect to the martyred heroes. They remain standing silently for sometime. Many meetings and seminars are held. People also prey for the salvation of the souls of the martyrs throughout the country in different religious institutions. 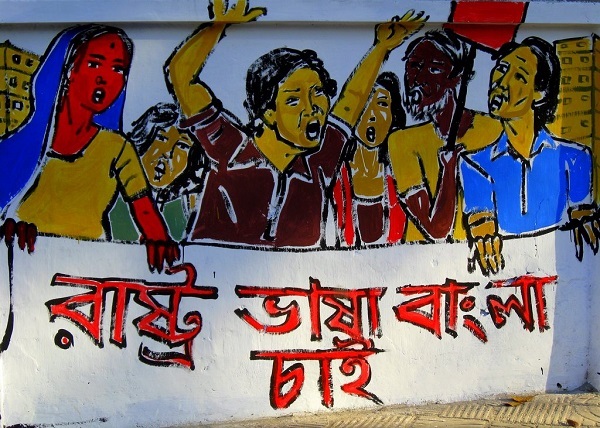 The 21st February occupies a significant position in the national history of Bangladesh. The events on 21st February, 1952 gave rise to a strong national spirit in us. This spirit gradually got more powerful and inspired us to carry on movement against the exploitation and injustice of Pakistani rules. Eventually we got entangled in the War of Liberation in 1971 and became independent. Thus the day bears a great significance for us.